Want to read more from God's word? Reading the Bible is about developing a relationship with God, through dependence on the Holy Spirit. The Holy Spirit helps us to engage with the Bible and to face God's challenge in the here and now. He will always point us to Jesus Christ, the heart of God's Word to us, the one who shows us who God is. Everyone needs a little help when reading the Bible. Sometimes the poetry and prose, history and revelation, or parables and proverbs need some explanation. Daily Bread provides real inspiration each time you read it. Our writers are from all kinds of backgrounds with all kinds of perspectives. We're sure you'll be challenged, encouraged, surprised and inspired as God uses the notes to speak into your life. Daily Bread January-March 2019 was published by Scripture Union in October 2018 and is our 2045th best seller. 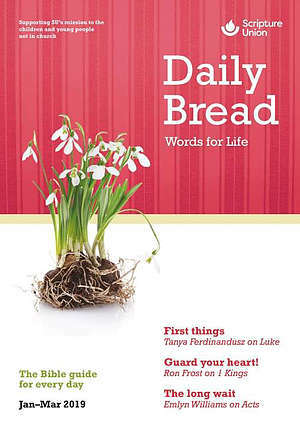 The ISBN for Daily Bread January-March 2019 is 9781785066962. Be the first to review Daily Bread January-March 2019! Got a question? No problem! Just click here to ask us about Daily Bread January-March 2019.